← Generation Two: Now With 10% Moar Death! Last time, Christopher joined Astra in the Great Sim Beyond and everyone re boarded the grief train for just one more turn. While everyone else was bawling their eyes out, I decided to check in on Jupiter’s progress. It seems he found himself a wife. I sent Castor over to investigate. Because you’re his brother, that’s why. Now go ring the doorbell. It would appear that Jupiter’s wife is very much pregnant. She’s not a bad looking pudding. I’m kind of surprised that Jupiter hasn’t dropped any of that extra weight since joining the army. Maybe that explains why he’s still a latrine cleaner? Castor, being the neurotic mess that he is, immediately checks their sink. Of course, Castor has to go and ruin this family moment by making a comment. Back at the house, Margot slaves over fixing the television that Crazy Pants Diana broke. How? Well, that’s the question, isn’t it? From the looks of it, she was probably trying to re-create Poltergeist. Sure, sure… throw the blame elsewhere. Miss. Crazy Pants Diana has been acting exceptionally weird lately. She’s an adult now, just like Castor and Margot (sorry, no transition picture) and everything seems normal, but she vomits at random. I can’t remember if I had her participate in any crazy experiments at work or not, but there’s no moodlet. It would seem that Artemis has attracted the attentions of the maid. He always looks at her with a flirty heart thoughtbubble or something equally as incriminating. I have no intention of setting her up with a maid, much less this one, but it amuses me nonetheless. Especially when it happens while she’s running around in her pajamas. Oh, psh, Castor. Don’t pull that father card with me. You’re about as present as Christopher was. Speaking of which, why are you just sitting around? I think you have some studying to do. Leo becomes a very… um, interesting looking teen. He definitely has Margot’s features. It adds to the whole ‘snobbish’ atmosphere he puts off. I even gave him a silly coif to go with it. Sure there is, like that silly hair you have. And those silly, tight pants. What’s up with that, anyway? Those are some seriously tight pants. Are you sure you’re not a girl? Sure you do… just like everybody else. Get used to it. Miss. Crazy Pants is acting exceptionally crazy lately. Margot and Castor enjoy some time between skilling and she throws a fit in the background. She’s actually just talking to herself, but the gestures and her facial expression say something different. …technically, it isn’t PDA if it’s in their own home, Diana. 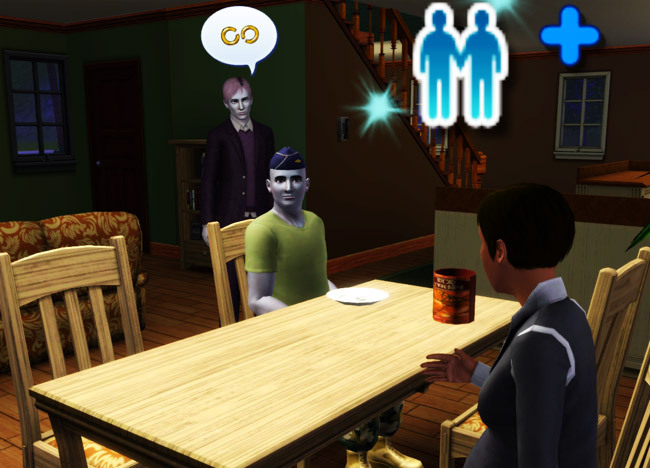 Oh, I hadn’t realised you were doing the Family Trait thing. Yeah…I’d find that hard to stick to as well! But oh my God…Jupiter in that last picture! LOL! I love how Artemis looks like she’s kind of rolling her eyes at her ridiculous father and uncle. That’s exactly what it looks like! It’s still not as bad as that neon pink and green painting that the low skillers paint in TS2 though! I am, but now I wish I wasn’t, LOL! Hahaha, the men in this family just don’t know how to keep their mouths closed. Lol, I love Diana, she’s classic. 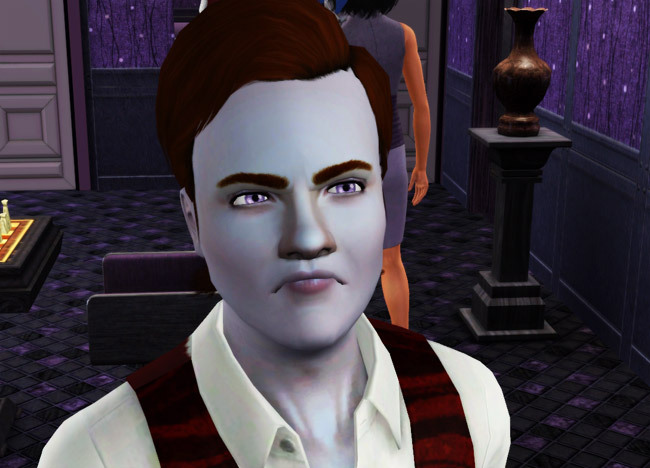 I was wondering what a neurotic/insane/perfectionist/neat sim would be like….sounds like a handful. But I’m thinking I might try it . So Artemis will be finding her man soon, can’t wait to see how that turns out. 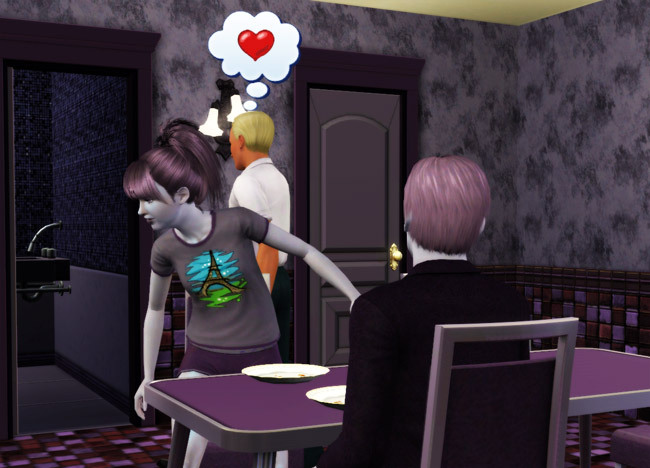 Hopefully she’ll find someone hot, there are slim pickings in Sunset Valley. I am so glad I kept Diana around… she provides me with endless amusement! 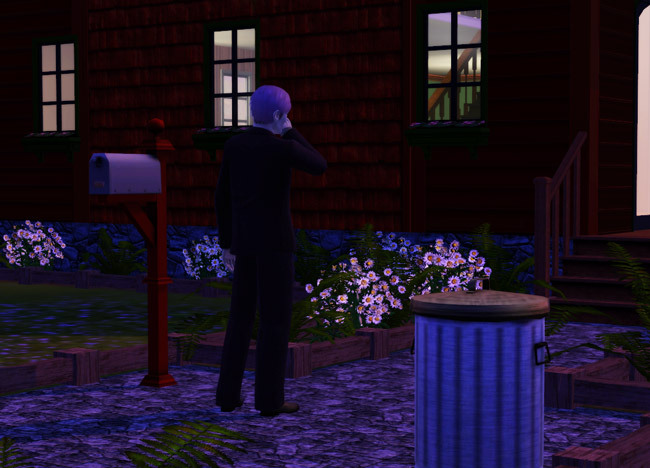 As for Artemis, she’s found her man and it wasn’t in Sunset Valley. I’m trying not to interfere with their babymaking abilities so the town stays full. Yay! I finally had time to catch up today while at work, and there’s still one (two? I forget) to go! Crazy Pants Diana makes me laugh; I’m really glad you didn’t send her out into the pudding zombies. Artemis is going to be a super awesome heiress, I think. Maybe she’ll outgrow that AWFUL FACE MAKING!!! Holy crap, birthdays in that house are like a freak show, ha! What kind of burglar takes the shower? I know I had the Repo Man take the counter in TS2, but I was kind of hoping they’d put an end to things like that. Oh well.